The crisis of 2008 was full of surprises. Among the most stupefying were the tales of financial wheezes people thought were a good idea during the preceding bull market. More will surely emerge as gallons of toxic waste slosh out of banks and hedge funds in 2009. While waiting for the full inventory, here are seven we hopefully won’t see again. These debt features were popular in 2007—but it wasn’t until 2008 that toggles started to get flicked. “PIK" stands for payment-in-kind, and means issuers can substitute more bonds for actual cash interest payments whenever they want. Sometimes the “rate" goes up when the toggle is switched. That’s cold comfort when it becomes apparent the bonds aren’t worth anything like face value because the company is going to the wall. The high probability of which, it should be noted, is why the issuer put in a PIK toggle in the first place. Retail investors in Asia hoovered up minibonds earlier in 2008, attracted by the fact these instruments, supposedly backed by a line-up of “safe" banks, had a higher-than-normal yield and were available in small amounts. The catch? They weren’t bonds at all, but derivative products, some of which had Lehman Brothers Holdings Inc. as a counterparty. Investors were effectively paying for Lehman to insure its own portfolio. When Lehman cracked, so did thousands of nest eggs. The accumulator is a device used to hedge cross-currency transactions. It limits the amount of profit the holder can make, but not the losses. That makes it cheap—and dumb. Citic Pacific Ltd lost $2 billion (about Rs9,580 crore) on accumulators when the Australian dollar fell hard. The normally staid conglomerate hadn’t just hedged, but made a giant speculative bet. Citic Pacific was effectively taken over by Chinese parent Citic Group—the ultimate slap on the behind. These options, which pay out in cash rather than actual shares, aren’t new or bad. But in Germany they became a battering ram for corporate raiders. Schaeffler Group, a ball-bearing firm, used cash-settled options to seize control of Continental AG, a car-parts maker. These options don’t need to be disclosed in Germany—even though the holder can, in practice, easily get the underlying shares. Germany hasn’t outlawed this practice. But the fact Schaeffler is now buried under a mountain of debt should discourage imitators. These provisions in some loans let the issuer expand them later—like an accordion—to let in new investors. During the crunch, subordinated investors in a couple of leveraged companies got a grim ultimatum: slide into the accordion on the company’s senior debt and take a big haircut, or end up with peanuts if the company goes bust. Senior lenders, meanwhile, faced the prospect of fighting for scraps with the newcomers if things really went wrong. Accordion facilities are thus as painful to the pocket as their musical counterparts are to the ear. Take money from Peter. Wait a bit, then take money from Paul. Use Paul’s money to pay back Peter, proclaim your stupendous rate of return, rinse and repeat. The Ponzi scheme, named after 1920s sheister Charles Ponzi, reached new heights in 2008 with the discovery of a $50 billion alleged fraud by financier Bernard Madoff—who somehow duped the world’s biggest and most conservative investment banks. These kinds of fraud are unlikely to die out in 2009. But the epithet may. 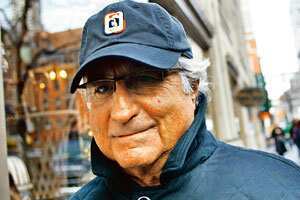 Investors will now be looking out for the “Madoff scheme" instead.